Preheat the oven to 180 °C (350 °F). Spray a 20 cm loose-bottomed cake tin with non-stick spray. Line the pan with aluminium foil. Sift the cake flour and mustard powder together and season with salt and pepper. Add the butter and rub in with your fingertips until the mixture resembles breadcrumbs. Add the fresh herbs, carrots and cheese and mix. Add the whisked egg and mix to form a smooth dough. Press into a ball and wrap in plastic wrap. Chill until needed. Meanwhile, heat the butter in a pan and sauté; the onion and garlic until glossy. 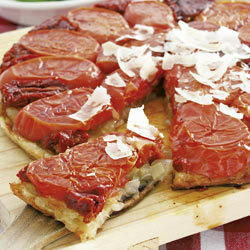 Add the tomatoes (cut into 7 mm thick slices) and fry rapidly on both sides (the tomatoes must not be soft). Remove the tomatoes and arrange in the bottom of the prepared cake tin. Add the vinegar and brown sugar to the onions in the pan and stir-fry for about one minute. Pour the mixture over the tomatoes and sprinkle with the breadcrumbs. Shape the dough into a circle big enough to fit into the cake tin. Place the pastry circle on top of the tomatoes, pressing down lightly. Bake for 25 minutes or until the crust is baked through and lightly browned on top. Cool slightly before turning out onto a pretty serving platter. Serve hot with plain yoghurt.